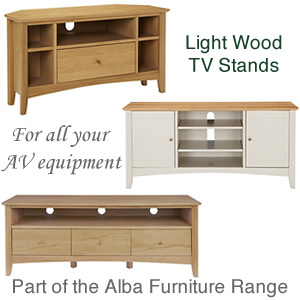 Made from American oak solids and veneers the oak TV stand is part of the Alba furniture range which includes attractive matching pieces for the living room and dining room such as a bookcase, lamp table, sideboard, dining and coffee tables, nest of tables, bar stools and chairs. The clean lines of a wide TV cabinet never goes out of style and looks great with the latest curved Television or larger TV screens. The spacious table top can easily accommodate modern entertainment systems and its sleek appearance will compliment today’s fashionable interiors. Available in two finishes, soft grey and oak to suit a variety of decors. Self assembly is required. Other details include cable tidies, three drawers and wide shelf space with cut outs at the back. Dimensions are H53 x W139.8 x D40cm. Newark Oak Wide TV Cabinet with 2 Doors - up to 53"
In a choice of two colour-ways with soft tones blending beautifully with existing furniture for an easy on the eye appearance. The two tone TV unit in soft grey and oak features plenty of storage options with two side cupboards and 4 shelves in total, two of which are removable. 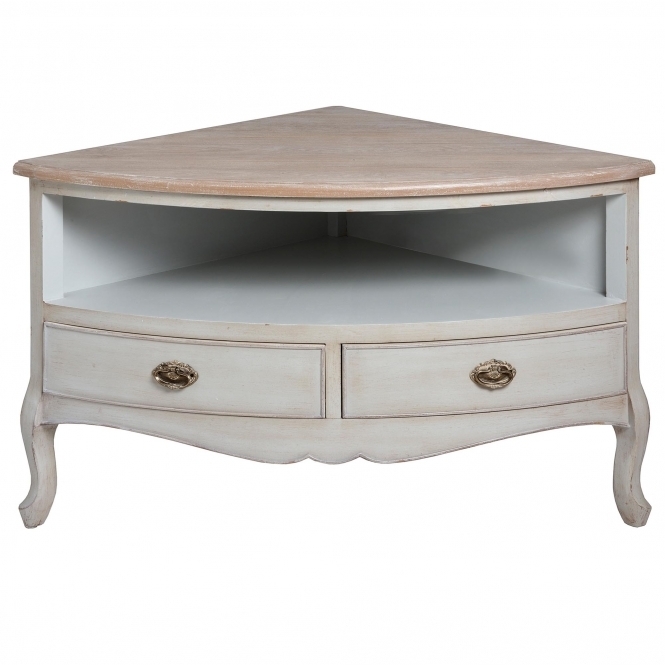 A natural look with an oak top and painted beech frames that will work with a host of other pieces in the range. A flat pack option with a difference, well finished, cable management and clear instructions for easy assembly. The dimensions fit TVs up to 40”. The simplistic lines of the Off the Wall Arc Curved glass and metal TV stand is an ideal accompaniment for a curved television. Its modest appearance doesn’t dominate the room allowing the sleek curvature of the latest screens to take centre stage. Features include a cantilever design in silver with an open front for maximum use of space. No need to worry about the clutter of cables either with a smart cable management system neatly hiding all the wires out of the way in the central column. A four socket extension cable is supplied which fits inside the column. Other details include 8mm safety glass top shelf that fits TV sizes up to 55” with overhang. AVF Affinity Plus Buckingham 800 TV Stand For TVs Up To 40"
John Lewis 850 Oval TV Stand for TVs up to 40"
AVF Affinity 1150 Bay Curved TV Stand For TVs Up To 55"
John Lewis 1200 Oval TV Stand for TVs up to 60"
Concave TV furniture such as the AVF Bay curved TV cabinet adds a touch of style to your living space. 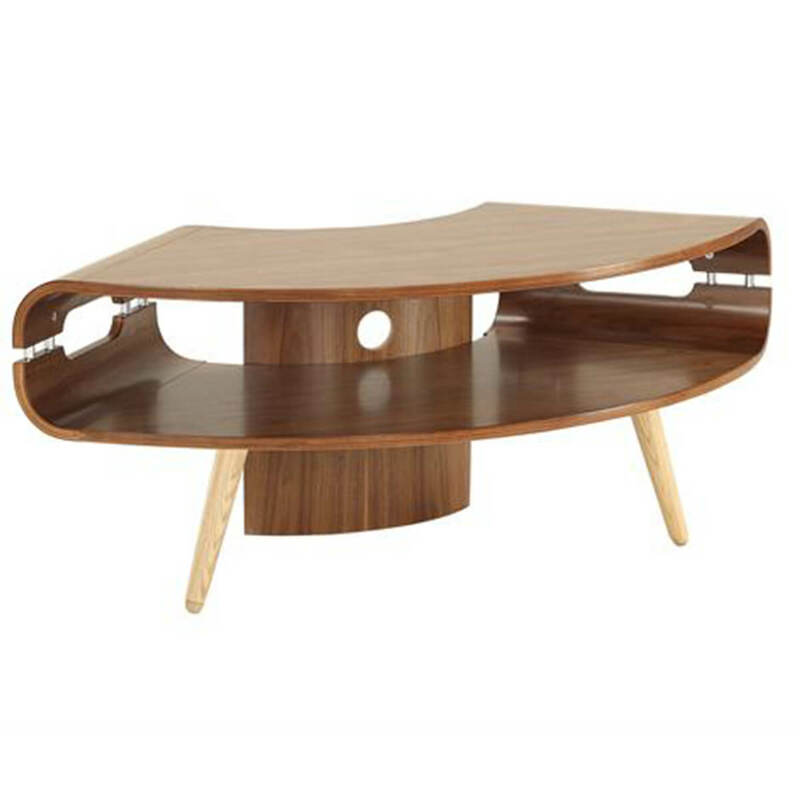 Available in real wood veneer in walnut or oak and a high gloss black finish. 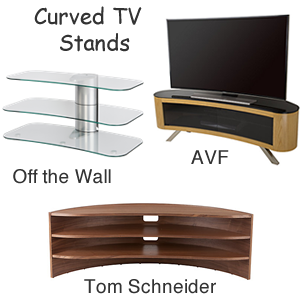 These modern TV units work perfectly with curve style TVs as well as flat screen and can be placed in any position. Best of all the AVF Bay stand has three height positions so you can find the best viewing height. Other details include several storage options and remote friendly smoked glass doors. A slotted base allows for adequate airflow and cooling of AV equipment. 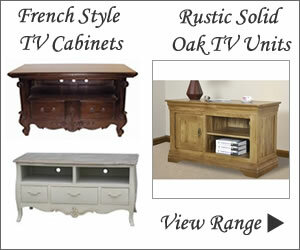 You can buy a corner TV unit or TV stand at many audio visual suppliers when buying the TV and most home and furniture department stores including M&S, John Lewis & Partners, Laura Ashley and Very These shops have a good choice of TV furniture that should help you find the TV stand or Cabinet to compliment your existing furniture whether it’s a drop leaf oak table or contemporary wall unit that match the style of your home. A complete range of solid oak furniture can be found at John Lewis. 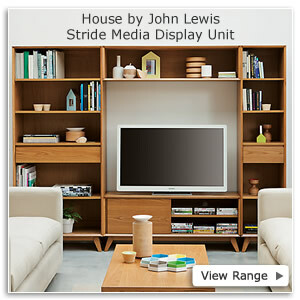 John Lewis & Partners is many shoppers favourite and has a good range of traditional and stylish quality corner TV stands plus modern TV cabinets too like the Cranford are made of solid oak and poplar veneers. Portobello Painted Corner TV Up to 40"
Newark Oak Corner TV Unit Up to 40"
Burford Painted Corner TV Unit - Up to 40"
Newark Oak Corner TV and DVD Cabinet - up to 47"
Chester Grey Large Corner TV Unit - up to 56"
Chester Grey Corner TV Unit Up To 40"
Oakland Corner TV Unit Up To 40"
Lundy Stone Grey Corner TV Unit - Up to 44"
Oakland Large Corner TV Unit - up to 56"
This has a shelf and drawer with two types of handles. It has an oak top that the TV sits on and is finished in parchment coloured paint. 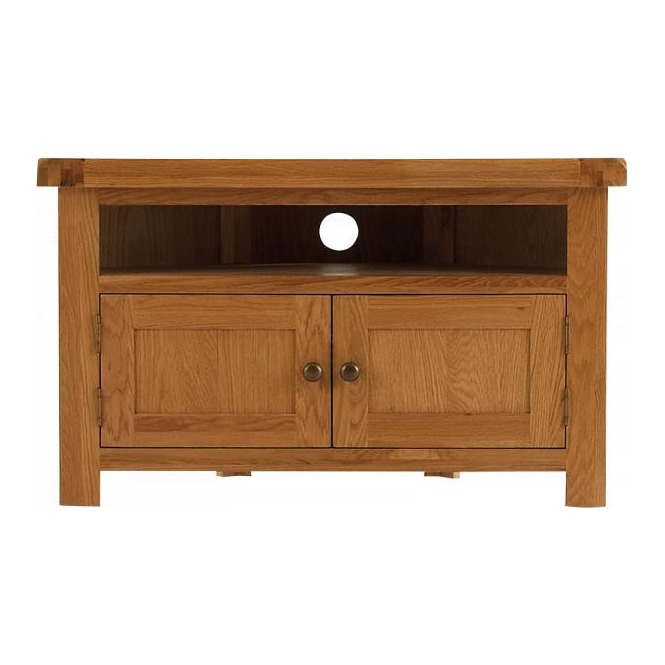 No assembly is required with this television cabinet and the dimensions are H57 x W105 D50cm. Another beautifully made piece of furniture is the John Lewis Monterey. Made from Chinese white oak solids and veneers that would compliment homes with pale floorboards. It has two cupboards, a shelf and cable access. It is a suitable for TVs up to 42 inch. Light wood cabinets are an attractive addition to the home with existing light wood furniture. The John Lewis 800/3BB Television stand is a great value stand and unlike other cheap versions has style written all over it. It can accommodate TVs up to 37” (94cm) and requires self assembly. The black glass shelves are perfect for your DVDs and digital boxes plus messy cables are easily sorted out with its cable management system. This black corner TV unit comes flat packed. Amazon has a range too which include the Vermont TV cabinet corner stand with drawers. This unit is a new addition to the Vermont furniture range. The Alphason Ambri ABRD1100-BLK Corner TV Cabinet supports LED TVs up to 50 inch. This new modern style has a smooth open and close door system and is made from black toughened safety glass. It also incorporates a cable tidy facility. This is a new model that measures 1100mm wide that is designed to fit into the corner of the room, store AV equipment and support the TV at an ideal viewing height. There is also a smaller version available (800mm). You will find Black glass stands are very popular and there are plenty to choose from. 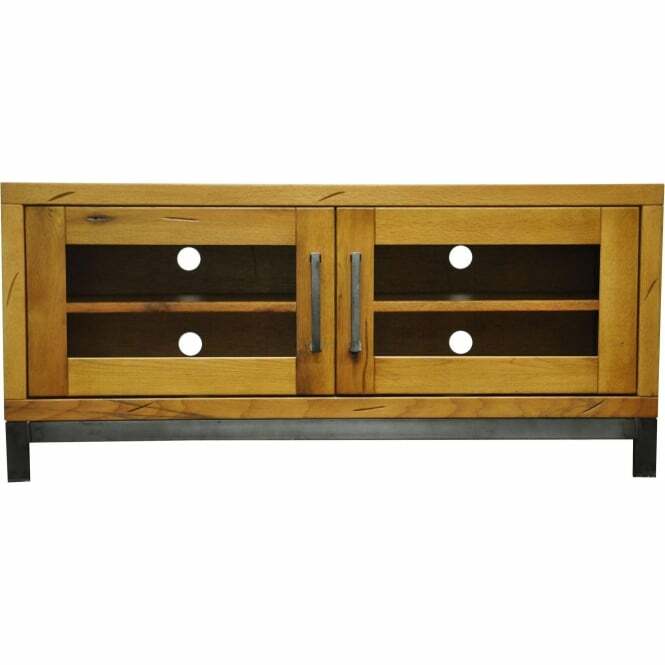 BDI ‘Avion Corner 8521 is a stunning dark oak corner TV cabinet for LED TVs up to 40”. It has adjustable floor levellers, concealed wheels and a cable management system. Adjustable shelves cater for CDs, DVDs, remote controls etc. Avion is a fine piece of furniture finished in beautiful dark oak veneer with complementary satin-nickel finish door handles and feet. A dark wood corner TV unit compliments the traditional living room furnishings and décor beautifully. 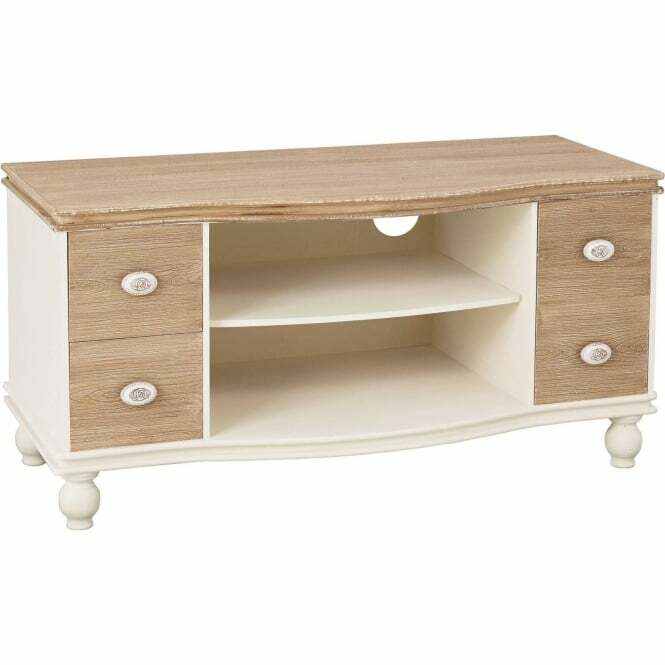 Online catalogues have a good range too such as the Town House “Panama” media unit. A self assembly cabinet that comes in a choice of either natural solid pine or dark-pine. It has wrought-iron effect handles and supports TVs up to 40ins. height 75, width 112, depth 50cms. Light and dark wood units along with traditional style entertainment centres designed to fit neatly in the corner at affordable prices.